In a stunning reversal of fortune, defending champions Les (Hollywood) Timmons of Kamloops, B.C., and Smart Frele Cat laid down an eye-popping score of 230 on Thursday evening – and then watched as Lyons, the cutting guru from Grandview, Texas, and Thomas E Hughes upstaged that performance with a breathtaking 231 to win the Open division of the Calgary Stampede’s 38th annual Cutting Horse Competition under the Big Top. Lyons, who has stacked up $3.5 million in career earnings through half a century of National Cutting Horse Association competition, stuffs another $8,822.40 in his Wranglers and wins his first Calgary Stampede championship buckle, to boot. Timmons, who’d won the 2009 Stampede cutting competition aboard Smart Frele Cat, had laid down the gauntlet with a dazzling run, as the pair befuddled a trio of bovines and got the Big Top crowd on its feet. 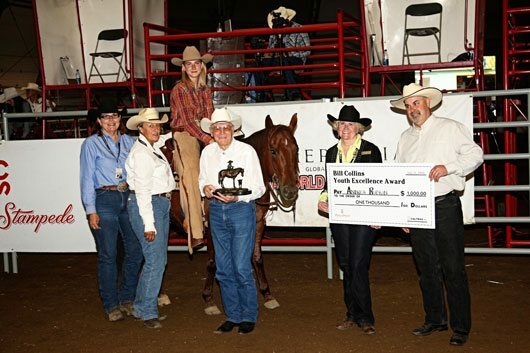 He eventually earned a second-place cheque for $7,057.92 as reserve champ. “The horse was good. I couldn’t ask for him to do any more. We cut good cows, and he was where he needed to be,” said Timmons, who earned his Hollywood nickname decades ago during cuttings at Vancouver’s Pacific National Exhibition (PNE). “That’s my first (230). The NCHA world record is a 232. The sport of cutting highlights the pure athleticism, instinct, agility and intelligence of the cutting horse. With horse-and-rider teams attempting to cut at least three individual cows out of a herd within 150 seconds, cutting has evolved into one of the most exciting equine events in North America. The Stampede’s four-day cutting competition, which began Monday, July 12 at the Okotoks Agricultural Society, is the sixth event on this year’s Mercuria/NCHA World Series, which has expanded to eight stops from its original four-city tour in 2009. 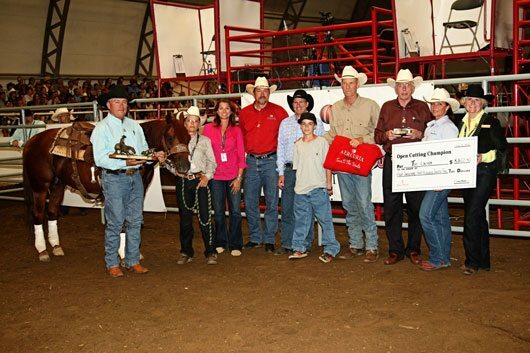 Because of the World Series’ involvement, the Stampede’s Cutting Horse Competition featured $25,000 in added money in each of the Open and Non-Pro divisions. The Open division featured a purse of $37,408, compared to $42,296 in Non-Pro. Dustin Gonnet of Cayley, Alta., placed third in the Open division aboard Christanis Blue, owned by Ronald Patton of Nanton, Alta., with a 222 score that earned him $5,293.44. Will Nuttall of Red Lodge, Mont., had some rotten luck in Thursday’s championship round – he placed two entries in the final 11, but lost a cow each time to drop out of contention. The NCHA’s popularity has gone international in the past few years, and that was evident again Thursday as a father-and-son team, Daniel and Benjamin Jaeggi of Geneva, Switzerland, advanced to the Non-Pro and Youth finals, respectively. 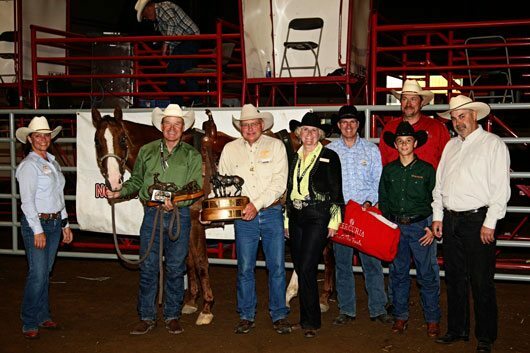 Daniel, the founder of Mercuria Global Energy Solutions, the title sponsor on the NCHA’s World Series, finished sixth in Non-Pro with a 214 on Bobs Lucky Lady. Benjamin, 14, acquitted himself well on WR Bingo Lingo, earning a 213 in Thursday’s final to go along with earlier scores of 210 and 211 in only his second cutting show. The first was in the north of France earlier this year. “I always wanted to do cutting. One day I woke up and I said, ‘It’s time,’” said Benjamin, whose sister Constance, 20, has shown in previous years at the Stampede’s cutting competition. “I like the contact between the horse and the cow. The feeling when he stops, when he runs . . . I love it.